I’ve been disconnected from the scrapbooking world for too long. I stopped scrapping when my son was born in early 2011. I wasn’t tuned into the ins and outs of the scrapping stuff until a month ago when I started blogging on my scrapbooking website. 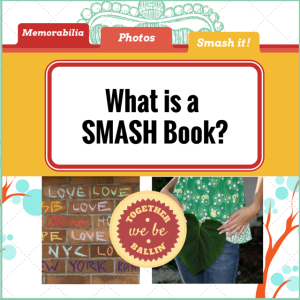 Today I learned what is a smash book and what is smashbooking about while reading through some blog posts about scrapbooking. I couldn’t remember how one thing led to another but suddenly I was trying to find out what smash booking is about. Yesterday, I’ve not even heard about this trend before. It’s interesting how after reading a few blog posts to find out more about smashbooking, I realized that smashers themselves are having a hard time trying to describe this smash booking trend that created some waves in the scrapbooking industry back in 2011. Some smashers even came up with images to highlight the difference between scrapbooking and smashbooking as they couldn’t find the appropriate words to express it. This is what my impression is about smashing after reading through various blog posts. It’s a newer form of memory keeping as compared to scrapbooking, and yet it reminds some people of what they used to do in high school except back then the journal books they’ve used weren’t prettily designed as a smash book and there weren’t any cool accessories to go along with. Smash booking is about documenting anything that matters to you without worrying about getting it neatly organized and you can smash in memorabilia, postcards, greeting cards, magazine cutouts, favorite quotes, photos, journaling, and other tidbits of stuff you can find to smash into a smash book but not into a scrapbook. There’s no concern here about making sure the supplies you use are acid-free. Below is a very quick video that demonstrates to you visually, what this type of memory keeping is about in less than 3 minutes. While scrapbooking would take more planning and a more organized effort, smashing seems pretty random and probably takes lesser time to be done. A smash book can act as a place where you can smash in different aspects of your life. Your musings, your goals, your milestones, your visions, your dreams, your project ideas, and even the holiday seasons. It’s a book where you can smash all these in without having the need to have a different scrapbook for different occasions or themes. I feel that smashing would probably appeal to people who step away from scrapbooking for fear of doing it wrong, not having the time, or find that scrapbooking a tad too old-fashioned. When you smash, there’s no rules to getting it right, and it opens up a lot of possibilities as to what you can smash in the book. So it might be a welcoming relief to those who possess a more eclectic style, who wants more freedom about smashing tiny bits of their everyday life without committing to a scrapbook. It’s also for people who feel that scrapbooking takes too much creativity than they could muster up. With smash booking, it’s not about perfection, it can get a little messy but it would be a beautiful mess that let you track your life as you live it. Your pages can be really random or you can decide on themes you’ll like to cover in your smash book. It’s like a mishmash of diary, art journal and scrapbook. It’s has a very “get it down on paper” philosophy. How to Make a Smashbook? Apparently, KandCompany came out with SMASH books for people to smash stuff in. These SMASH books come in various themes, and inside each SMASH book, there will be designed paper that fit in with the theme. I’ve seen how pretty some of these pages could look. I’ve read of comments that sometimes people find the pages too pretty to smash in. With SMASH books, you don’t have to buy patterned paper or cardstock to smash in. You smash right on the pages themselves. You don’t need to buy loads of scrapbook supplies like scrapbookers tend to do. If you’ve been scrapbooking for awhile, you’d likely have accumulated a good amount of embellishments. Use them to decorate your smash pages if you like, especially those embellies you don’t know what to do about. There’s another unique thing to each SMASH book, it comes with a half-pen half-glue unit. So you can conveniently stick on whatever stuff you want to your pages with the glue stick end, and use the writing end to journal right on the pages. Clever idea. Looks like smash book accessories have been rolled out to help smashers to have more fun and choices when decorating their pages. Here’s a selection of the more popular accessories that smashers seem to enjoy using. Alright, I’ve found another video where a smasher shares what she has done to the first few pages of her SMASH Book, as well as how she decorated her cover page. She used a good number of scrapbook supplies to dress up her smash book pages too. So if you scrapbook, you can extend your scrapbook supplies to be used in your SMASH Book too. Right below is the Baby SMASH Book the girl has mentioned in the video. It does have a lovely colored binding! So if you love this color and don’t mind some of the baby designed paper inside, you can give this a go. Like the girl, you can cover up the baby paper with other paper and it will work too. Smash books are what scrapbooks used to look like before they became a serious craft. In other words, “smash” books are the original “scrap” books. You used scraps of memories as you seldom had photographs. You would write (journal) a description so everyone would know what the scrap represented. It was a fun way to keep those memories of Woodstock alive, back in the day when not many people had cameras. A scrapbook by today’s standard is a complex work of skillfully organized displays, designed to commemorate photographs. I think it could be correctly called a commemorative display album, and call a smash book simply what it is…a scrapbook. This is so interesting…so when I smash book I put whatever I want and journal at the same time right? I hope this is true…I’d like to get into this soon. 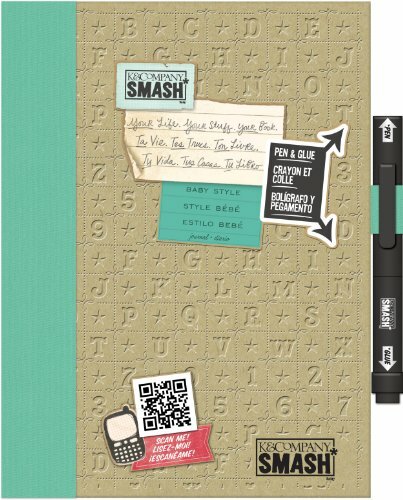 You can journal or write descriptions and put whatever memorabilia you like into your smashbook. Have fun smashing! I personally enjoy “smash booking”. I use it as a travel scrapbook as a reminder of all the places I have visited in the year of 2017. I plan to have a different smash book for every year that passes. I noticed when I use it for travel I do not run through the book as fast. I have read many reviews on smash booking and a lot of people say you can use a regular journal instead of buying the $11-$16 smash book. Personally I like the messages on each page and like how each page is unique from others. I am really happy I found out about K&Company Smash books and I would recommend them and also recommend watching videos on YouTube for ideas. Hi. I fell in love with scrapbbooking until a few years ago when I stopped. Now that I am retired I want to get to know what I have been missing. Today I came across smash booking. I loved the bible journaling and the planner journaling and now this. I have so much stuff that I will have lots of fun this summer. I have done chronological scrapbooks for my granddaughters since they were born up to age 10 and 12. Then I got behind and their activities have increased so much I am overwhelmed. Is a SMASH BOOK style book the way I should go now? They are 12 soon to be 13 and 14 soon to be 15 now and I can’t even sort the stuff age-wise now. I need a quick but NICE way to do their books. I just can’t do them by years anymore. First off, I’d like to say, you’ve done a wonderful job scrapbooking your two granddaughters’ early years! Wow, 10 and 12 years of consistent scrapbooking of their growing up years. Amazing. It’s not an easy feat. It’s not surprising that as they are older now, their activities have increased to the point that it can get overwhelming for you to keep up with chronological scrapbooking. If you still like the idea of scrapbooking, you can go another route, scrapbooking only selected major events or some of the favorite memories as they happen. With this style of scrapbooking, you can break away from having to be tied to a timeline and creating scrapbook pages to cover all the activities that have occurred in that year. It’s about choosing things you want to scrapbook about. As for smashbooking, it’s an even more relaxed style, where you just add in memorabilia or journal onto the smashbook directly and you don’t have to put in as much planning and thought like a regular scrapbook. You can start from today, you don’t have to backtrack the years. You can smashbook in things about your granddaughters as you want to. Maybe add a photo of an event and write in a few words relating to that photo. Stick in a map of a place they’ve been to. Record down some of the things they’ve said or done. For a smashbook, you don’t even have to add any photos. Do what you want with your smashbook. If the thought of “being caught up” isn’t appealing and that it might take the joy out of scrapbooking, give yourself the permission to continue with your memorykeeping in another way that don’t weigh you down. Try scrapbooking only memories or events that you feel like scrapbooking about, and leaving the rest to be relived through photos. People take tons of digital photos these days that are more than enough to jot one’s memory of that event. If smashbooking appeals to you and you feel it’s a nice way for you to continue with your memorykeeping journey, by all means try it out and see how you like it. The scrapbooks that I’ve seen from the 1930’s, 50’s and 70’s were more homemade than today’s scrap booking. Smash books might be closer to the original, but perhaps using mixed media from the craft store, versus scraps from around the house, magazine and newspaper cuttings. The level of organization and style depended on the individual. I’m not sure that I like the name smash, a bit of marketing I guess. Thanks for sharing your observations about smashbooking and how it seems to be closer to scrapbooking from the early days! Like you pointed out, the name might be from a marketing angle, to perhaps try to differentiate it from modern scrapbooking and making it stick.